Micron has remained one of the more stable players in the SSD space over the past few years. Although not typically at the top of our charts, Micron (and its consumer brand, Crucial) have generally paired the latest in NAND technology with custom firmware that’s well validated. It sounds like a simple combination, but it’s so rarely found in an industry that’s growing quickly enough to both those that are first to market as well as those that are most reliable. Lately, Micron has been trying to make more of a splash in the market. 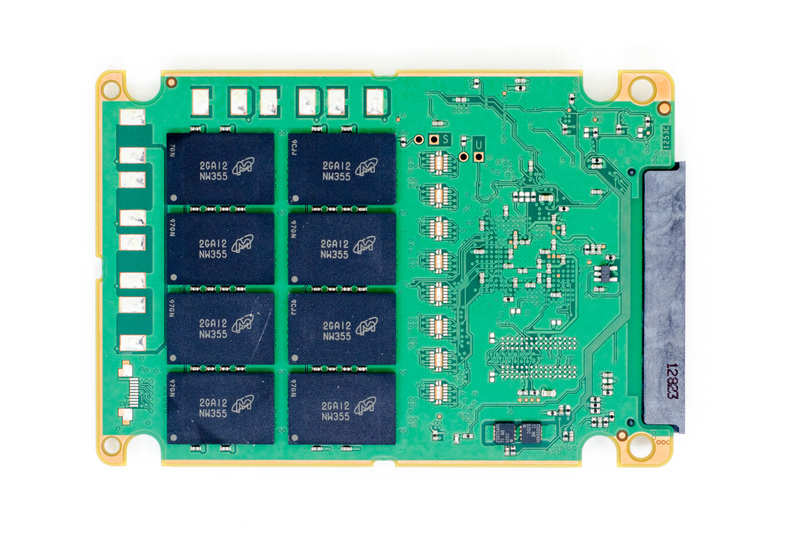 Earlier this year it announced the first consumer SSD to feature 128Gbit MLC NAND die, the M500. Through aggressive pricing on its end, Micron hopes to be able to deliver a 960GB M500 for less than $600. Whether or not this is realistic remains to be seen, but the fact of the matter remains that this is a level of aggression we hadn’t seen previously from Micron. On the enterprise front, Micron is looking to fill a gap in its product lineup. 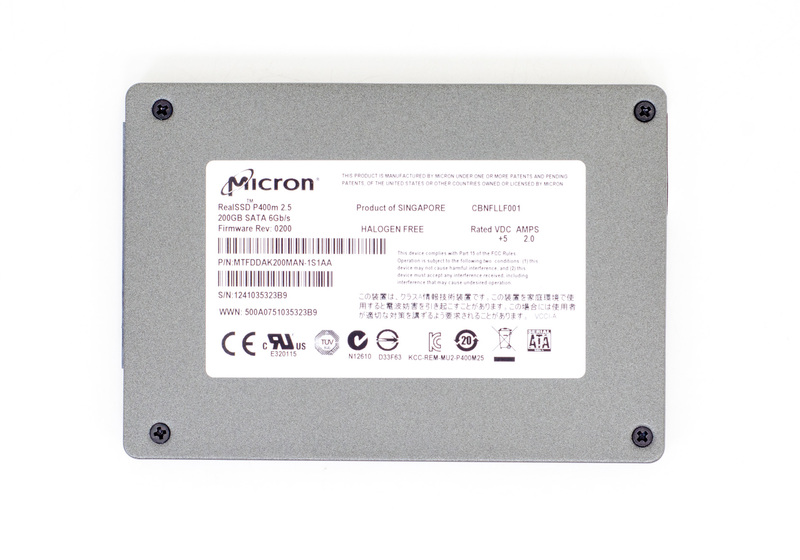 In the 2.5” SATA form factor, Micron really only had two offerings: the dated SLC-based P300, and the entry level P400e. The former was built for a market that has increasingly moved to high-endurance MLC NAND, while the latter wasn’t robust enough to deal with any of the more write-heavy enterprise environments. Filling the gap is the drive we’re looking at today: Micron’s P400m. Like many Micron drives before it, the P400m uses a Marvell controller coupled with Micron developed firmware and Micron manufactured NAND. For the uninitiated, Intel and Micron have a joint venture (IMFT) that produces NAND which is then used by both companies as well as sold to others. Allegedly, Intel and Micron save the best NAND for themselves, giving them a slight edge in the endurance department (I’ll get to this momentarily). The P400m features Marvell’s latest high-end SATA to NAND Flash controller, the 88S9187. The P400e before it used the 889174. These part numbers should look pretty familiar as they’ve been used by everyone from Intel to Plextor. The differentiation in the firmware, validation and NAND of course. 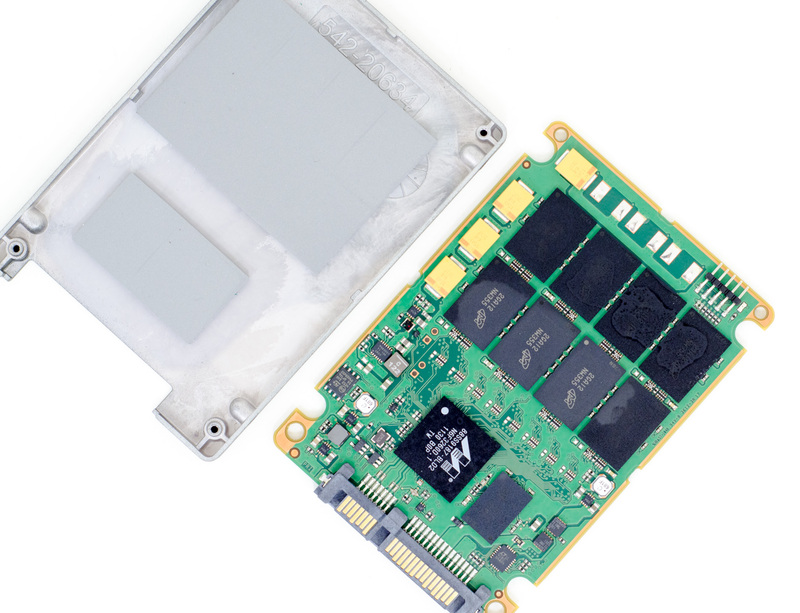 The 9187 controller is passively cooled, but Marvell slapped a thermal pad on the chip to help use the drive’s 7mm chassis to dissipate heat. Adjacent to the controller is a 256MB DDR3-1333 DRAM for firmware and indirection table caching. The P400m is available in three capacities: 100GB, 200GB and 400GB. Micron sent along a 200GB model, which features sixteen NAND packages. A quick look at the part numbers reveals something interesting however: there’s no known record of the 2-bit-per-cell MLC NAND used on this P400m. Micron has an explanation: the P400m uses Micron’s custom 25nm MLC NAND that isn’t available for purchase by other vendors. It’s called XPERT (eXtended Performance and Enhanced Reliability Technology), and is akin to Intel’s MLC with High Endurance Technology. The P400m’s XPERT NAND leverages a handful of technologies that we’ve seen before in enterprise drives. Micron does some DSP-like work on the NAND over time to compensate for drift in cell read/program voltages. There’s a RAID 5-like redundancy algorithm in effect across all NAND channels. Finally, Micron performs CRC and ECC checks on all memories in the P400m’s data path. The P400m uses NAND binned for endurance. Micron also does its own testing on the NAND to weed out any premature failures. 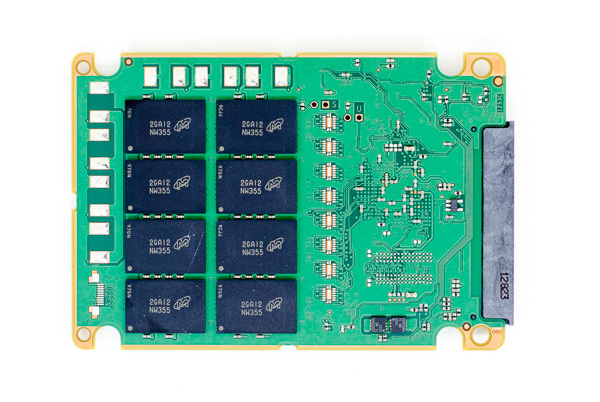 Like many other enterprise SSDs targeted at write heavy workloads, the P400m features a lot of spare area. The 200GB sample Micron sent over features 16 NAND packages. Decoding the part number on each package tells us that we’re dealing with four 25nm MLC NAND die per package. The capacity per die is unique at 42Gbit. Doing the math we end up with 336GiB of NAND on a 200GB P400m. This is a lot more NAND than you get with Intel’s S3700, and even more than Intel shipped on the 710. The added NAND helps keep write amplification low, and endurance up. The P400m is rated for between 1.75PB - 7PB total writes over the lifetime of the drive. These ratings are determined using worst case write amplification (full span 4KB random writes), so many workloads will see even better longevity out of the drive. Micron added power loss protection to the P400m. The company claims that all writes in flight will be committed to NAND in the event of sudden power failure. In many senses the P400m is Micron’s answer to Intel’s S3700. Update: Micron tells us that the initial pricing guidance on the P400m was incorrect. Micron isn't providing updated pricing information at this time, other than to say it will be competitive. I don't get your point? The point of a warranty is to guarantee performance up to the stated warranty period. That's never been about quality or not. Whether you get a good unit back from warranty is entirely going to be luck of the draw with any manufacturer. Why would an enterprise replacement be unreliable? Hardware fails... that's why there's a warranty in the first place. Well..that states specifically that it uses XPERT technology but not that the NAND is XPERT NAND. All the NAND is pretty much the same. The only thing really different with the NAND is binning during probe. A fuse blown here, a fuse blown there. Fab process is the same.